Pittsburgh International Airport is located approximately 18 miles from the Wyndham Grand Pittsburgh Downtown. Quite unfortunately, the hotel does not have a free shuttle from and to the airport. (They do have a shuttle that will operate within a 3-mile radius of the hotel...just not to the airport.) Because of this, we sought out alternatives for transportation between the hotel and the airport. This is probably the most economical option. 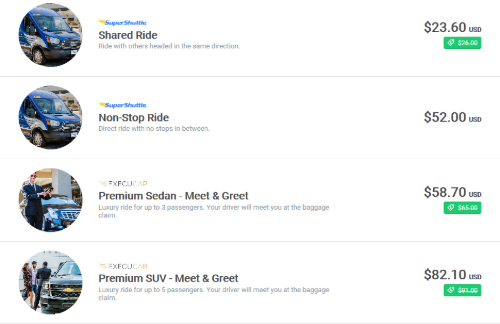 The normal price for SuperShuttle between the hotel and the airport is $26 (USD).One of our GCLS members negotiated a discount for Conference attendees. For $23.60 each way, you can make reservations for SuperShuttle to transport you to the hotel when you arrive in Pittsburgh and back to the airport when it's time to head home. You can make your reservations online at the website the folks at SuperShuttle provided for us. If you need a wheelchair lift or ramp, check that box on the reservation form. There are some Commonly Asked Questions on the SuperShuttle site should you have specific questions. Scroll down. They're toward the bottom. Uber, Lyft, and zTrip are all available in Pittsburgh. The price difference between them is fairly negligible. Based on the pricing estimate calculator on the Uber and Lyft websites, we determined that the cost will run you between $30 and $40 each way. Unfortunately, the zTrip site does not have a pricing estimate calculator. You'll need to download an app to use these services. Pittsburgh International Airport is among the first airports in the country to establish a policy allowing transportation network companies to pick up passengers. Uber, Lyft and zTrip have secured permits under the new policy, allowing passengers to hail a ride via a smartphone application. Uber, Lyft, and zTrip is located outside Baggage Claim Door #4. "ACCESS is a shared-ride, advance-reservation paratransit service that operates throughout Pittsburgh and surrounding Allegheny County from 6:00 a.m. to midnight, every day of the year. Eight companies provide service for ACCESS. Riders must use tickets to pay for their transportation. The number of tickets charged for a trip depends on the length of the trip. The minimum one-way fare is 4 tickets ($2.25) and the maximum is 8 tickets ($4.50)." There is some prep-work that goes into using the ACCESS service. You'll need to qualify for the service at least 2 weeks in advance of your travel to Pittsburgh. For more information, visit the website to learn the requirements for qualification and to request an application. Depending on the traffic at the time of your trip, the cost of a taxi is approximately $42. There is a list on the website for the Pittsburgh International Airport that list the services (limousine, taxi, shuttle) that have secured a permit to operate out of the airport. If the above information does not fit your needs, please look at this website for more information.